A Gift For TAY! Enjoy Responsibly! You guys know this fellow, no? After ID posted his amazingly awesome TAYbot mascots, I recall someone asking me a while back to render this...Beargod thing into a proper form. Maybe Geebs? So here it is guys, enjoy! Took about an hour and a half of on and off work between some other projects I was working on. What do you think? 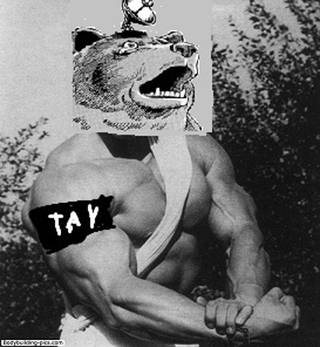 Stay cool, people of TAY. And don't forget about me! I know I haven't been posting much but I do drop in everyday to read your guys' content and support your work when TAY gets it's blip in the morning. P.S. The finale to the art tutorial has been cancelled. Sorry about that! Hope you found the first and main post informative! SupremeEvan, I still owe you a look over and will do so soon on the originating post!